The proposed rules for a new payment reform initiative — the Medicare Shared Savings Program (MSSP) — are expected in December. And neurologists could well be affected. The program will allow Medicare to contract with accountable care organizations (ACOs), which will give neurologists and other physicians a financial incentive to practice high-quality, low-cost medicine. The idea behind the ACO is to establish a network of physicians and other health care providers who are jointly held accountable for meeting certain standards of care while lowering costs by reducing the use of unnecessary tests and treatments. ACOs take responsibility for the full range of services needed by a defined set of patients. Payment arrangements will vary by payer; some private payers will offer global payments or full capitation but the Medicare program will share savings with providers. Rhode Island neurologist Joel M. Kaufman, MD, thinks the ACO payment model may work well for neurologists who can manage their patients’ high-cost conditions, such as Alzheimer disease and stroke, so that they avoid expensive emergency department visits and inpatient stays. “As neurologists, we will be an important and valuable piece to help these ACOs be successful,” said Dr. Kaufman, chair of the AAN Professional Association Payment Policy Subcommittee. An ACO that meets quality thresholds and keeps spending below a certain benchmark will share the financial savings with the Medicare program. In theory, Dr. Kaufman, executive director and CEO of Lifespan/Physicians Professional Service Organization, thinks the ACO concept will reward neurologists who spend more time talking with their patients instead of ordering expensive tests that are of questionable benefit. The MSSP, which is voluntary, will begin no later than 2012. Many private payers have begun to introduce “accountable care” contracts as well, although they may define an ACO differently than the government does. In Minnesota, for example, Fairview Health System is transforming itself into an ACO to contract with one of the largest payers in its market. As part of this effort, Fairview's primary care physicians are using “care packages”— specific protocols for certain conditions — to standardize high-quality, low-cost care. For example, a migraine care package is being used to reduce the use of unnecessary images, urgent care and emergency department care; to make appropriate referrals to neurologists; and to reduce the amount of lost work time of migraine patients. Sarah Maier, MD, a family physician at the Fairview clinic in Hiawatha, MN, said family physicians, nurses and others on the care team coach their patients to use diaries to understand their headache triggers and thus avoid headaches whenever possible. Other inventions include teaching patients to recognize early symptoms so a migraine is mitigated and to effectively use their medications. “I have definitely seen improvement among my patients,” Dr. Maier said. Laura Powers, MD, former chair of the AAN Medical Economics Management Committee, encouraged neurologists to begin exploring ways to formally align with other physicians who are organizing to join an ACO to position themselves for payment reform. For starters, she suggested that neurologists network with other physicians in the community to investigate their options for joining an independent physician association (IPA). An IPA is a legal organization through which independent physicians in a geographic area jointly contract with payers. Because IPAs include a large number of physicians, they may plan to establish their own ACOs; alternatively, hospitals that are creating ACOs are likely to approach IPAs in their market as a first step in their physician-recruitment efforts. To prepare, Dr. Powers recommends that neurologists review and adjust their practice patterns. “Be very proactive in customizing care so the patient gets the best care and, in places where you can reduce cost, do so without jeopardizing patient care,” Dr. Powers said. In addition, she suggests that neurologists acquire and use an electronic health record system that allows patient data to be shared among providers. “Unless you can share data, you can't completely coordinate care,” Dr. Powers said. Finally, neurologists should be able to demonstrate and market their value to an ACO, Dr. Kaufman said. “For example, if I can show that, for my MS patients, I offer superior access to my office so they don't go to the emergency department or get hospitalized very often, that would be very attractive and make an ACO want to contract with me,” Dr. Kaufman said. Group Health Cooperative, an integrated delivery system in the Seattle area, was recently chosen by Washington State to lead two new ACO pilot projects. While neither pilot is up and running, Tim Scearce, MD, Group Health's chief of neurology, has already adopted many of the protocols that will be needed to succeed in an ACO. That is because Group Health includes both an insurance company and a multispecialty medical practice that employs physicians. The insurance company benefits when unnecessary utilization of health care services is avoided; the salaried physicians have no financial incentive to order unnecessary tests or schedule follow-up visits that could be handled over the telephone or via a secure online message. Dr. Scearce noted that overall Group Health has lower rates of hospitalization and readmission than most other medical groups in the Seattle area. Dr. Scearce has identified some practice strategies that support that goal. For example, he reviews the patient's electronic chart days prior to the visit to optimize face-to-face discussion time. Because many neurology patients have trouble understanding or remembering what is said during a visit, Dr. Scearce provides each patient with a typed after-visit summary including details about the medication doses and schedule. These summaries often include diagrams or images from their scans. Each note ends with a request for a follow-up secure message (via Group Health's EMR system) or return visit to see if the plan has worked. Neurology Today10(23):36-37, December 2, 2010. 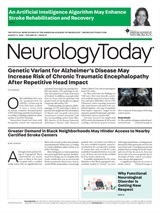 VIEWPOINT: What Will Neurology Look Like in the Future?